Developing efficient protocols for the synthesis of macrocycle-containing molecules has been a longstanding challenge in chemistry. In a recent OBC publication, collaborative efforts between Prof. Tomás Torroba of the University of Burgos and Prof. Luis Miranda of Universidad Nacional Autónoma de México have resulted in a diversity oriented synthetic strategy for the synthesis of biaryl-containing macrocycles. Macrocyclic structures have utility in many different areas of chemistry and have significant applications in medicine due to their broad range of biological activities. Compared to small molecules, macrocycles offer unique functional advantages in terms of selectivity and potency as their cyclic framework enables a high degree of structural preorganization such that key functional groups can interact across extended binding pockets without a major loss of entropy. Moreover, macrocycles display favourable drug-like properties such as improved solubility, lipophilicity, membrane penetration and stability. Of interest are peptide macrocycles containing an endo aryl-aryl bond which constitute an important class of biologically active macrocyclic natural products. In terms of established synthetic approaches, two strategies have been commonly implemented 1) construction of the biaryl unit followed by a cyclization and 2) ring closure through the formation of the aryl-aryl bond. These routes are limited however by the synthesis of the peptide backbone which typically requires challenging multi-step sequences. 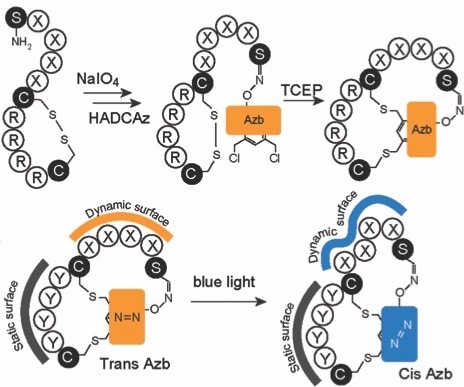 To circumvent this issue, Torobba and Miranda proposed a sequence combining a Ugi four component reaction (Ugi-4CR) with a Suzuki-Miyaura cross-coupling for rapid access to the desired macrocycles in a diversity oriented approach. 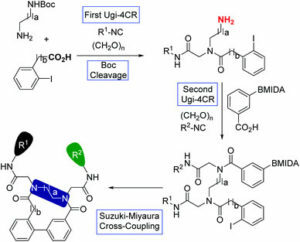 This synthetic strategy is composed of four steps: 1) Ugi-4CR using two bifunctional building blocks, the mono-Boc protected diamine and iodine containing carboxylic acid; 2) Boc cleavage; 3) a second Ugi-4CR involving a MIDA protected boron-containing carboxylic acid and finally 4) Suzuki-Miyaura cross-coupling-based macrocyclization. After optimisation, the synthesis of a small collection of biaryl-containing macrocycles was carried out with good overall yields (35-65% isolated yield) and their cytotoxicity evaluated against eight human cancer cell lines. 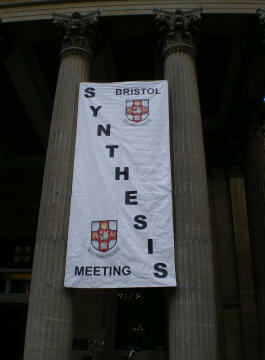 The ease with which this synthetic sequence can be reproduced in combination with their preliminary biological results will no doubt open doors for the future evaluation of larger collections of this class of biaryl-containing macrocycles and in determining their full potential in drug discovery.